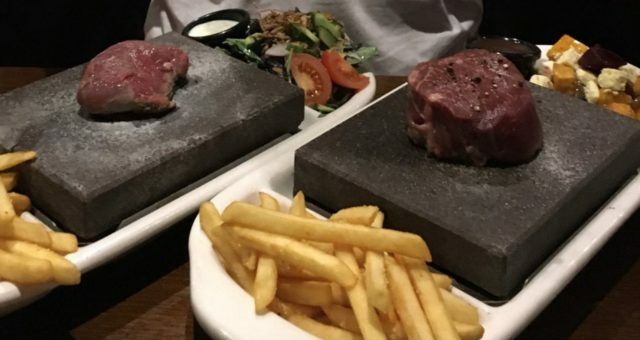 Wednesday night’s special at the Saints bar restaurant here in Hanmer Springs, is 2-for-1 stone grill. Having never tried a stone grill before, I couldn’t imagine it would be so easy, or so tasty. We tried both the venison and the beef steaks. They came out on a flat lava stone which had apparently been heated to 400°C! It meant that we could slice off pieces of meat and cook them to perfection, every piece. As we sliced, cooked and ate, the stone slowly cooled, so the meat never got over-cooked or cold. The roasted vegetables* on the side and chips were a perfect accompaniment, and they stayed warm from the dish that supported the hot stone. Definitely a repeatable mid week dinner choice.